Al Pacino heads a stellar cast in this powerful, unsentimental and critically derided depiction of the American War of Independence. Since its original release in 1985, director Hugh Hudson (Chariots of Fire) and Al Pacino have returned to the film, making several changes including the addition of a voice-over for Pacino's character. Now a new BFI Dual Format Edition is to be released by the BFI containing the definitive Director's Cut of Revolution on DVD and Blu-ray, and includes new interviews with Hugh Hudson which explore the history of the film's production and the differences between the different versions. Epic in scale and execution, Revolution follows the fortunes of single father Tom Dobb (played with dogged resilience by Al Pacino) as he fights to protect Ned, his only son, against the violent course of history. The supporting cast includes Annie Lennox, Joan Plowright, Steven Berkoff, Dexter Fletcher and Sid Owen. 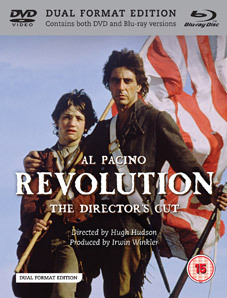 As well as Revisiting Revolution, in which Al Pacino and Hugh Hudson discuss their vision for Revolution: The Director's Cut, two newly commissioned interviews feature Hudson talking about the making of the film, illustrated with production stills by renowned photographers David Bailey and Don McCullin, and about the various changes he made to the original film to create his new cut. Hudon worked closely with the BFI to create this new cut, and will be introducing and exclusive screening at the BFI Southbank on Thursday 14th June for BFI members. Revolution: The Director's Cut will be released on UK dual format (DVD and Blu-ray) on 18th June by the BFI at the RRP of £19.99. Extensive booklet with essays by Nick Redman, Philip French, John Corigliano, Michael Brooke; reviews and a director biography.